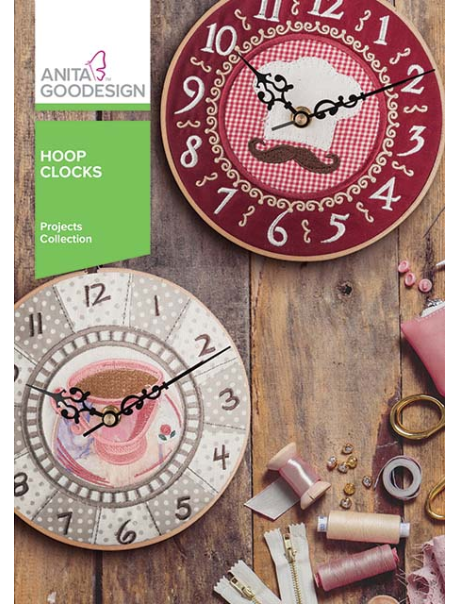 You won’t lose track of time creating our newest project collection, Hoop Clocks. If time is money, then it won’t take much to make these unique hoop clocks. The collection includes 12 different designs that are created using a handful of embroidery techniques such as appliqué, folded fabric, and even our radial technique! Each design differs from the next with unique style and flare. You could make a different hoop clock for every room in your house! The step-by-step tutorial will teach you how to create the designs first on your embroidery machine. Then, show you how to assemble your hoop clock using a battery operated clock kit that can be found at your local craft store. Not only are these hoop clocks practical, they are quick and easy to make! You will be amazed how you can transform a simple wooden hoop into a stunning wall clock with this new collection. We know your time is precious, so don’t waste another minute and get started creating your very own! $20 per the class; plus $34.95 for the design CD, $1.99 for wood embroidery hoop, and Quartz Clock Movement Mechanism (available at craft stores) Please call store to register.